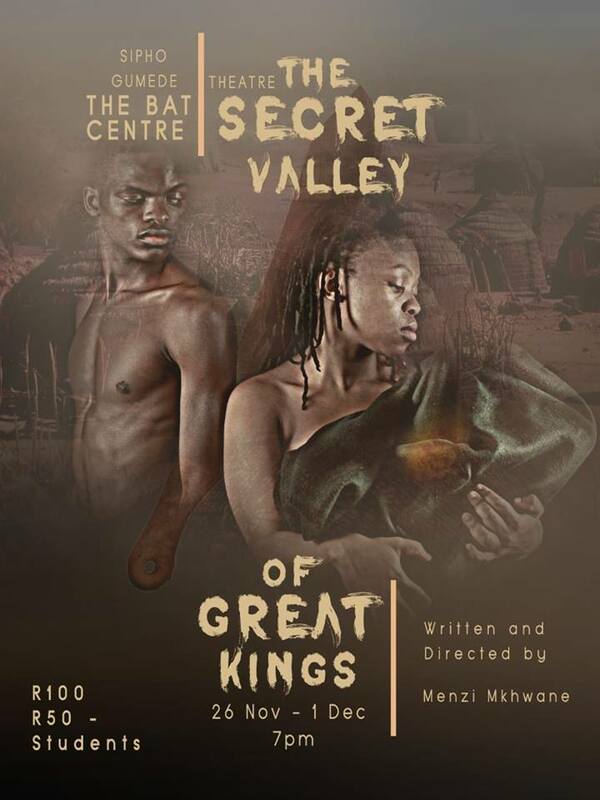 Secret Valley Of Great Kings is an epic theatre thriller written, produced and directed by Menzi Mkhwane. It is set in North West Africa during the 1400s and tells the story of a young girl named Kotso who is born in a small tribe called Khigubhu during a time of war. This war has been consuming the continent for many years and the reason behind it is unknown. All the elders have mysteriously disappeared, all the mothers, fathers and grandparents and great parents are all gone. Only the children are left behind. It is in this setting that Menzi Mkhwane’s lead character Kotso sets the story in motion. Once a strange gigantic fiery rock crash lands on the continent and destroys a sacred mountain. The war is stopped and Kotso who has given birth to a baby boy named Mashariki takes this opportunity of stillness and peace to travel to Malugueta – the last empire; to visit the last living diviner, Naomi, to discover the ancestral destiny of the child. What she discovers threatens to change her life forever. “Building this show for me is perhaps the most enchanting, challenging, exciting and mind-expanding experiences of all the plays I have ever assembled. It is also the biggest play I have put together with a total cast of 10 actors,” says Mkhwane confidently. Mkhwane is currently building a theatre company in Durban that hopes to stay for a long time in KZN. The theatre company is staging one show a month and each year has a calendar of plays set and plotted many months in advance. He works with a small team that helps him put together trailers, design posters, set up for each show and drive content on the next shows on social media. Secret Valley Of Great Kings comes up at the end of November for Durban audiences. And many might wonder is it not a risk to do a heavy drama during November which leads into the festive season? But Mkhwane believes that the approach to the play is very invigorating, dangerous, edgy and tantalizing enough to pull an audience. His theatre company is new and he will only be launching the logo and the name officially next year in August. He is not worried about small audiences but “more about LISTENING to the few people that come in through the door because responding to their needs will bring in the bigger audience over time”. Secret Valley Of Great Kings is a solid story, with all the correct storytelling beats, action, a bit of comic relief and emotive drive that would keep an audience glued throughout. It is an important story to tell and it is not a story we will be telling all the time so it has to be executed in a special way. Mkhwane is a hard-working young man who writes, directs, produces, teaches and acts. So he has an intimate understanding of the hard work it takes to put together a well-rounded play. “I think people underestimate how much planning I put into each show I put together. It can never be taken for granted that every single theatre experience must and should be absolutely interesting. I think people think just because Secret Valley Of Great Kings is a drama it will be flat and that to me is not the case,” he says. In his three act play which is performed in a dialect of Swahili by all the cast members there are North Western musical pieces designed by Aphiwe Namba along with the cast that drive the show. There is also live music that will be put together along with the story which is played by Mthunzi who underscores each scene the cast performs with a Djembe. There are also very tight fast-paced fighting sequences with machetes that will be performed that display fights that the young warriors engage in. And so the story is very multi-layered. “I think as a theatre company that will be providing more light hearted shows as Durban audiences have demanded – it’s important to challenge our audiences with something new and dangerous yet still tasteful and Secret Valley Of Great Kings is a great way to bring Durban audiences into that!” he comments. “I am tired of black audiences being blamed for not paying to come see shows. The truth is the quality of many black theatre shows has been poor over the years and has not been challenging or feeding the needs and demands of the audiences and that is why we have lost a lot of people. We are also talking more to our audiences daily and want to get to know them and not just ask them to be with us only when we stage shows and I think this is our greatest game changer,” he adds. Audiences must expect an explosive, dangerous theatre experience that will leave them breathless as Menzi Mkhwane takes Durban audiences deep into the heart of the African continent and an almost prehistoric era. Secret Valley Of Great Kings opens on November 26 and runs until December 1 in the Sipho Gumede Theatre (Bat Centre) at 19h00 each night. Tickets R100 (R50 students) at the door. For more information, contact Menzi Mkhwane on 079 554 4941.